Cost, content and target audience should influence your choice of print finishing and print binding. MBM Stitchmaster is inexpensive and is well suited for large press runs, such as with a mass-market magazine. In this binding method, loose sheets are laid over a saddle-like holder where staples are forced through the spine of the pages at a very rapid rate. Investing in bindery equipment for saddle stitching would make the most business sense when the volumes are high and the publication’s shelf life is short. Side-stitch binding is an option when the publication is small, impressing an audience isn’t the goal, and unit costs must be very low. The process is similar to saddle stitching, except that the staple is forced through the sides of the pages near the folds instead of through their spines. It will give you a less attractive and less durable binding. Perfect binding is the best choice when the publication is larger (50 pages or more), the audience is more up-market and/or the look and feel of the publication must imply that its content is special and substantial. Annual reports, textbooks and upscale magazines are typically perfect bound. In this process, all of the pages are placed together and stitched through the spine. Then the spine edge is ground flat and the cover is glued on. Case binding makes sense when the publication must be very durable as well as impressive. The process is almost the same as perfect binding, except that the spine is reinforced with a cloth strip before the cover is attached. 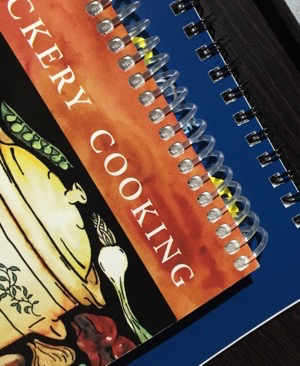 Comb binding is ideal for business reports, cookbooks and workbooks because it allows the finished publication to lie flat when opened and permits pages to be added and removed. This method is also used by companies to bind internal, short-run publications, such as training and product manuals and other publications not intended for customers or not subject to hard use. In comb binding the curved plastic teeth of a comb are inserted into holes along the edge of the pages. Coil or spiral binding also allows the finished publication to lie flat when opened. In this method, a wire or plastic spiral is threaded through round holes punched in the edges of a stack of the pages. While the finished binding is more durable than with comb binding, pages can’t be added or removed. You might use this process for journals, student workbooks or other publications intended for frequent or hard use. 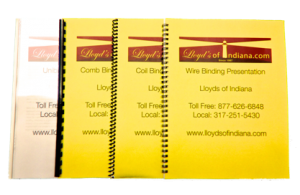 Wire binding uses tooth-like loops of wire in a fashion similar to comb binding, but produces a much sturdier binding because the binding material is metal instead of plastic. Post binding is for heavy-duty publications with constantly changing content. Examples include scrapbooks, photo albums and carpet sample books. The binding process is simply metal posts pushed through punched holes in the pages and anchored with bolts that thread into the center of the posts. Each binding method also has variations involving the use of special materials — such as ribbons or screws — and more manual labor. Unit cost is higher, but the resulting publication will stand out. Commemorative albums, special event programs and menus are some of these specially bound publications. For any printer considering the purchase of bindery equipment, the most important consideration, of course, is what your customers want. If they all have similar needs, then you need only a limited range of binding capabilities to satisfy them. But if your customers’ expectations are diverse — or if you’re planning to expand into new markets — then the wider range of capabilities that come with having a wider range of bindery equipment would make the best business sense.